Don’t look for the big, quick improvement. Seek the small improvement one day at a time. I was recently asked to give a presentation on retrospectives at my company. After many years of doing retrospectives, it's always good to remind myself that the power and benefit isn't totally apparent to people who don't do them regularly. My wife, being a school teacher, of course laughed at me because her entire professional life is about helping people see what isn't initially obvious to them. 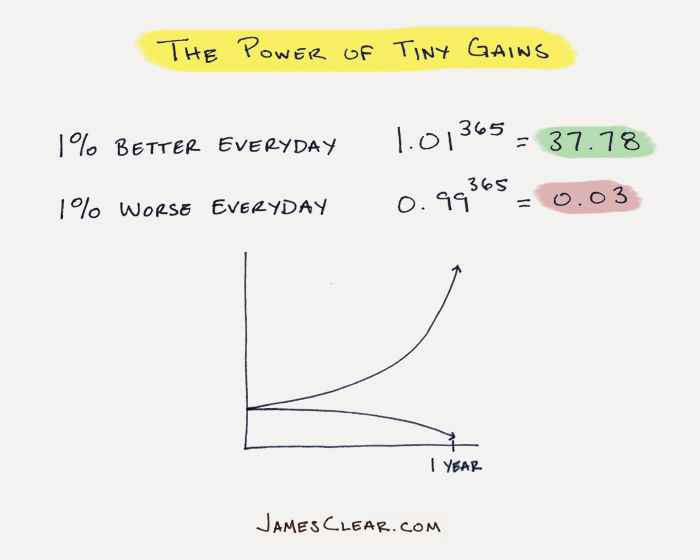 If a person or team devotes to getting 1% better every day for a year, at the end of the year the team will be 37 times better than when they started. Conversely, if the team slides or doesn't improve or gets 1% worse every day for the same year, at the end they will be 0.03 times better... or 97% worse! This argument of course is someone hyperbolic to prove a point, however it does illuminate the need to constantly improve. For a more realistic calculation, if a team does a retrospective every week, and they devote themselves to being 3% better each week, at the end of a year they will have numerically improved by a factor of 4.6. 3% improvement every week is an extremely realistic goal for any team, and retrospectives are an excellent vehicle to make it a reality.